.Adobe ransomware is a computer virus that is related to the Dharma ransomware category. .Adobe ransomware is a file extension virus that was initially used by Dharma ransomware family. It used a strong encryption cipher AES or DES to encrypt data with the following extensions: [stopencrypt@qq.com].adobe, [btcdecripter@qq.com].adobe, [backtonormal@foxmail.com].adobe. Then, malware dropped a ransom note “FILES ENCRYPTED.txt” which explained the situation to victims. This version of .Adobe ransomware runs a process “BulkFileChanger (32bit)” in the background. 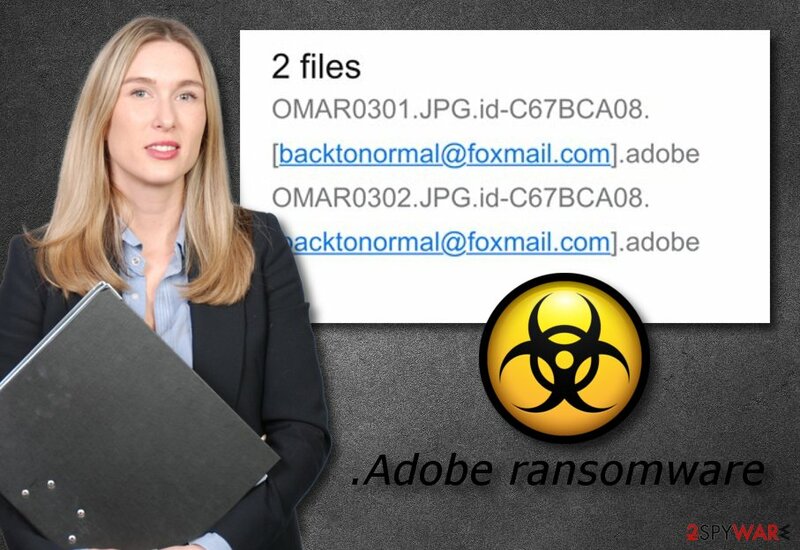 However, in late January 2019, researchers discovered that the .adobe file extension is also being used by Djvu ransomware – a variant of STOP virus. This version should not be confused with Dharma. To identify it, victims should check contact emails – pdfhelp@india.com, pdfhelp@firemail.cc, and the ransom note _openme.txt. In this version, .Adobe file virus authors demand users to pay $980 in Bitcoins for file release. Spam emails, adware bundles, cracks, keygens, etc. 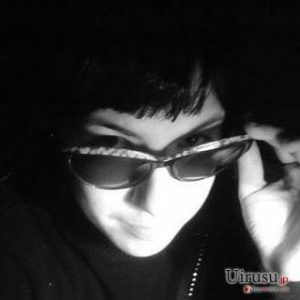 Cybersecurity experts from the Virusai.lt website are warning users to be careful while considering whether to pay the demanded ransom price or not. Cybercriminals who spread the .Adobe ransomware might try to convince users into paying the money. However, that does not mean that these people will fulfill all of their promises. Be careful while dealing with the crooks, better avoid any contact with them if possible. .Adobe virus - ransomware which adds specific extensions to the encrypted files and displays the FILES ENCRYPTED.txt ransom message. 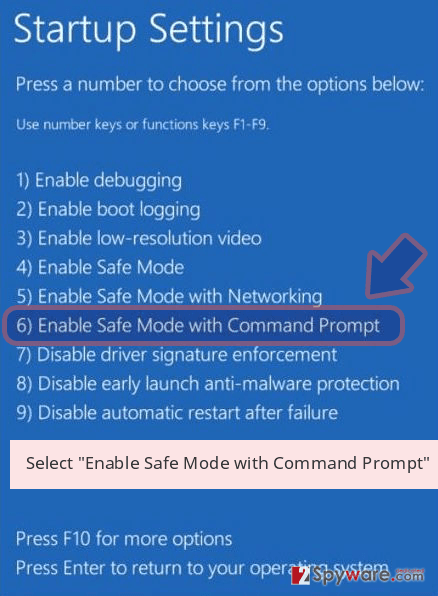 Furthermore, if the ransomware virus shows on your Windows computer, it can modify the Windows Registry by adding dubious registry entries to it. When you perform the .Adobe ransomware removal process, you need to make sure that all virus-related components are also removed. 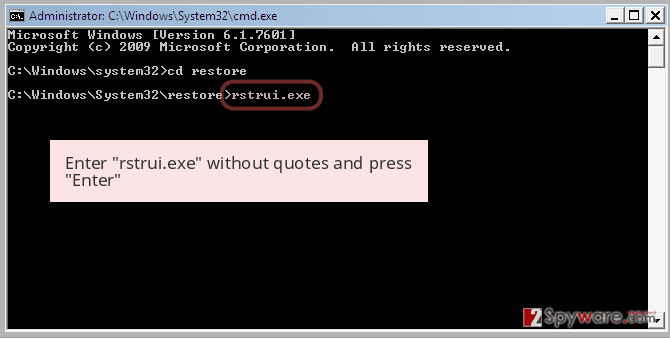 To detect rogue content, you can consider downloading and installing computer security software such as Reimage or Malwarebytes MalwarebytesCombo Cleaner. Note that it is very important to remove .Adobe files virus before you perform the dencryption process. Otherwise, the ransomware virus might renew the encryption activity, and all of your files will be locked again. 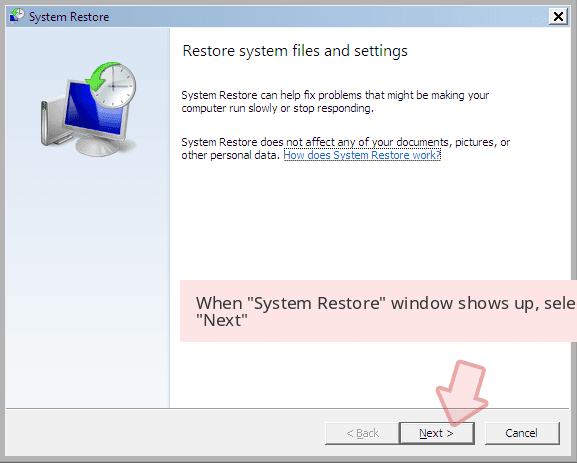 After you get rid of the file locking virus, scroll down the text and check out the provided data recovery methods some of which might appear to be very helpful if performed as shown in the instructions. suspicious entries have appeared in the Windows Registry. 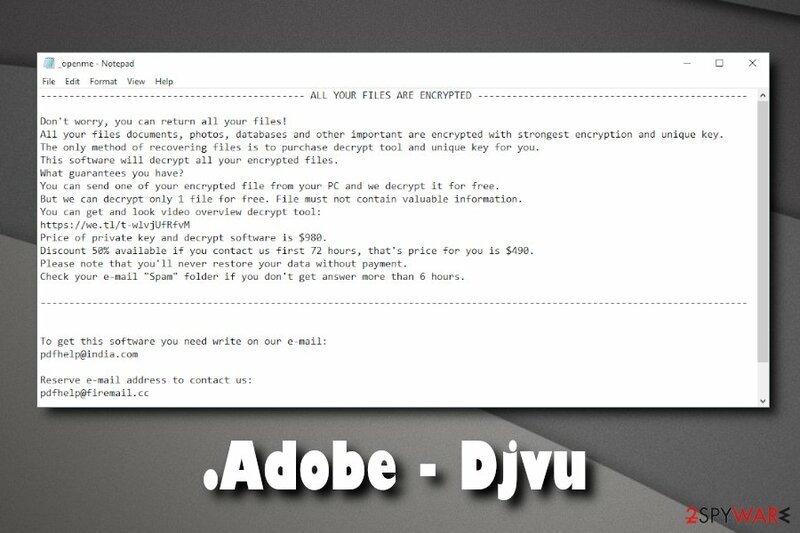 Security researchers discovered a variant of Djvu ransomware which uses .Adobe file extension - ransom note in the picture. 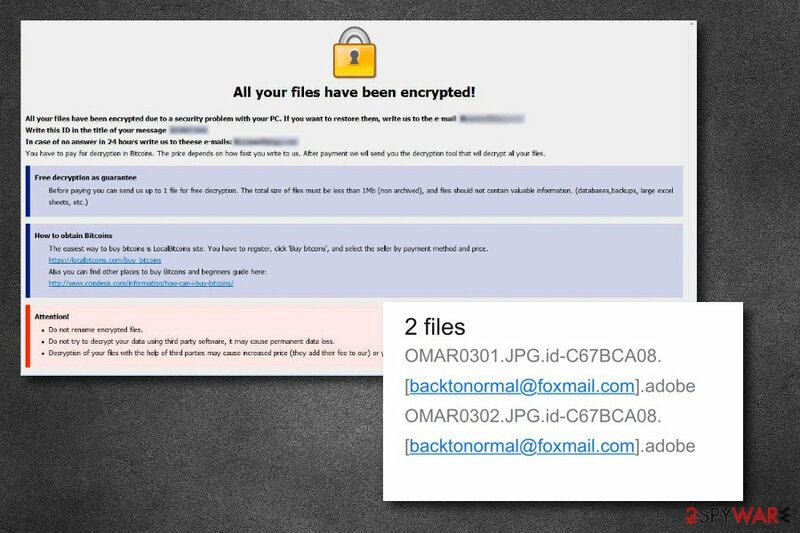 If a ransomware virus has appeared in your computer system, there is a big chance that this cyber threat was secretly installed after opening a dubious email message or an attachment that was clipped to it. Our recommendation is to be careful while opening your received email. Note that cyber crooks are very likely to drop deceptive messages with rogue attachments to random users' emails. The hazardous message might fall into the Inbox or Spam section. Moreover, some criminals might hide ransomware viruses inserted in rogue hyperlinks. Be cautious while visiting less-known websites, especially, third-party ones as they might relate in a dangerous and secret ransomware installation. For further protection, do not hesitate to invest in a truly reliable anti-malware tool which will automatically protect your computer system and keep it safe from various threats which might occur while performing computing activities. 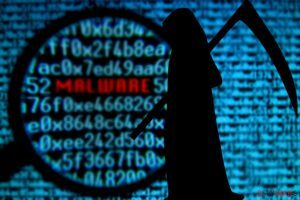 Performing the .Adobe ransomware removal manually is not possible for this case as it might appear very hard to carry out even for professional malware specialists. 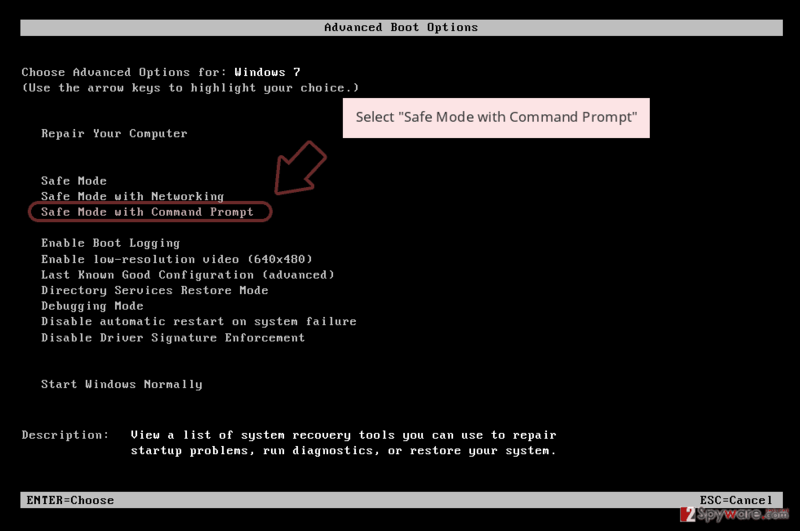 For the elimination purposes, you should download and install a reputable computer security tool which will take care of the entire process and ensure you that all ransomware components have been removed successfully and the system is finally clean again. You can use anti-malware programs such as Reimage, Malwarebytes MalwarebytesCombo Cleaner, or Plumbytes Anti-MalwareMalwarebytes Malwarebytes to find all rogue components before you remove .Adobe virus from the computer system. Once the removal is finished, make sure you refresh your entire PC. Furthermore, do not forget the ransomware avoiding steps that you have read in this text. You can also keep your files safe from unexpected encryption by storing them on USB drives or Cloud servers. Log in to your infected account and start the browser. Download Reimage or other legitimate anti-spyware program. Update it before a full system scan and remove malicious files that belong to your ransomware and complete .Adobe removal. 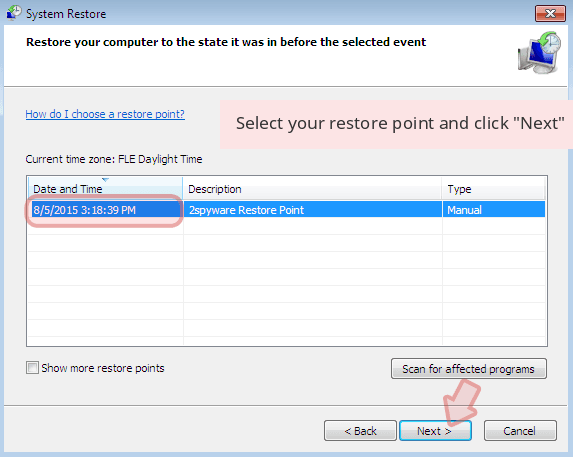 When a new window shows up, click Next and select your restore point that is prior the infiltration of .Adobe. After doing that, click Next. Once you restore your system to a previous date, download and scan your computer with Reimage and make sure that .Adobe removal is performed successfully. Guide which is presented above is supposed to help you remove .Adobe from your computer. To recover your encrypted files, we recommend using a detailed guide prepared by 2-spyware.com security experts. If .Adobe ransomware has locked important files of yours, you should avoid paying the demanded ransom and consider thinking of other ways to restore your data. 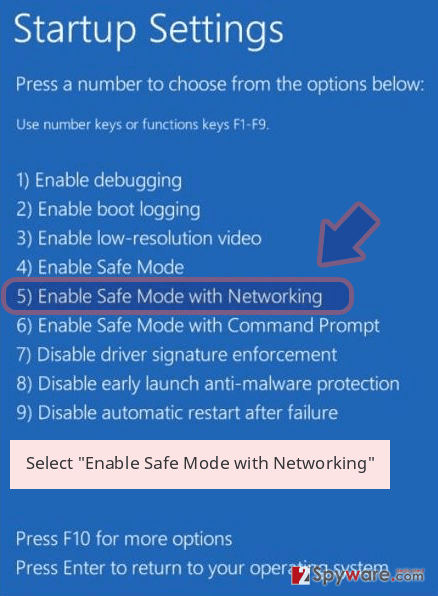 Try the below-given data recovery methods to unlock some files. Try this tool and you might have a chance of unlocking some important documents. 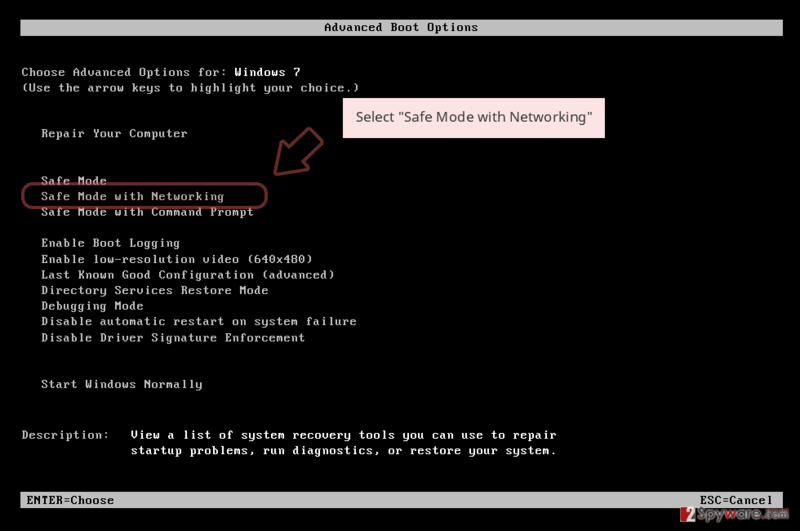 However, note that this method might not work if you did not activate the System Restore feature before the cyber attack emerged. If the ransomware virus did not erase Shadow Volume Copies of encrypted documents, you might have a chance of recovering some of your files. Computer technology experts have not found out the official .Adobe ransomware decryptor yet. ^ Michael Gillespie. #STOP Djvu #Ransomware. Twitter. Social Network. ^ Virusai.lt. Virusai.lt. Cybersecurity news page. This entry was posted on 2019-04-01 at 00:55 and is filed under Ransomware, Viruses. You can quickly scan the QR code with your mobile device and have .Adobe ransomware manual removal instructions right in your pocket. How did you remove .Adobe virus?